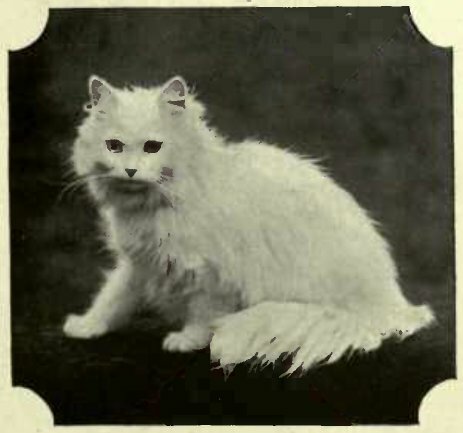 One of the most lovely white imported cats was exhibited by Lady Marcus Beresford at the Westminster Cat Club Show in 1900. The best judges declared that there was not a fault to find with „Nourmahal,“ but her career was a short one. These imported cats are often of a rather savage disposition, and, although they can be sweet-tempered enough with human beings, they are extremely fiery with their fellows. There are two points peculiar to the white cats – they are frequently stone deaf, and they very often have odd-coloured eyes. Certainly the deafness is a drawback, and in selecting a white cat care should be taken to ascertain if the specimen is possessed of sound hearing. Needless to say, there are many ways of arriving at the solution of what is really a mysterious dispensation of Providence, for why should one particular breed of the feline race be so constantly minus this useful sense? Then, again, as regards the quaint arrangement of different-coloured eyes. One might not be so surprised if the eyes of white cats were sometimes pink, for their noses are pink, and the cushions of their feet, and, as in human beings, we might expect to have albinos amongst cats, namely white with pink eyes; but Harrison Weir states he has never seen pink-eyed whites, although it has been asserted that they exist. This peculiarity, however, of odd eyes seems only to be found in white cats, the two colours being blue and yellow. Occasionally white cats have wonderful sea-green eyes; and although these are decidedly very uncommon, no colour is so completely in accord with the purity of the coat as eyes of heavenly blue. The tone should be not so much of a sapphire as of the deep forget-me-not blue. One of the drawbacks to white Persians is the difficulty of keeping them in spotlessly clean condition. This is absolutely impossible if they are living in or near a town, and certainly a white cat soiled is a white cat spoiled. The devotees of the white cat in our own country are not many in number. I may mention Mrs. Finnie Young and Miss Hunt, who are perhaps the most successful breeders of whites in Scotland; and in the south we have Mrs. Pettit, whose tribe of blue-eyed whites I had recently the pleasure of seeing. No more lovely specimens could be imagined, and I counted more than a dozen long-coated, full-grown, bonnie blue-eyed beauties, walking about in the woods surrounding Mrs. Pettit’s dwelling-place near St. Leonards-on-Sea. 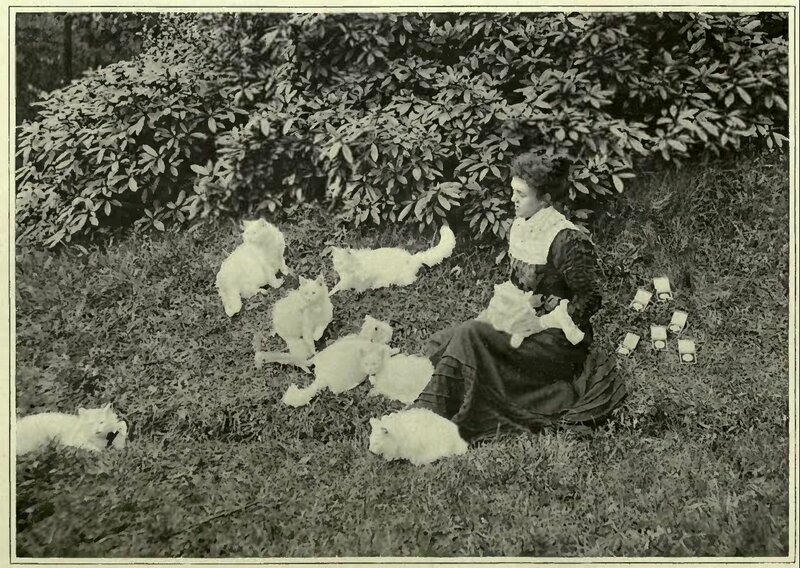 The illustration shows Mrs. Pettit surrounded by eight of her pretty white pussies. Mrs. Westlake, Mrs. Nott, Miss White Atkins, and Miss Kerswill are all successful and enthusiastic breeders of white Persians. Several well-known fanciers keep one white cat amongst their flock. I may mention the Hon. Mrs. McLaren Morrison, the owner of „Musafer,“ a famous imported puss, and Lady Decies, the former possessor of „Powder Puff,“who has recently been presented to H.H. Princess Victoria of Schleswig-Holstein. 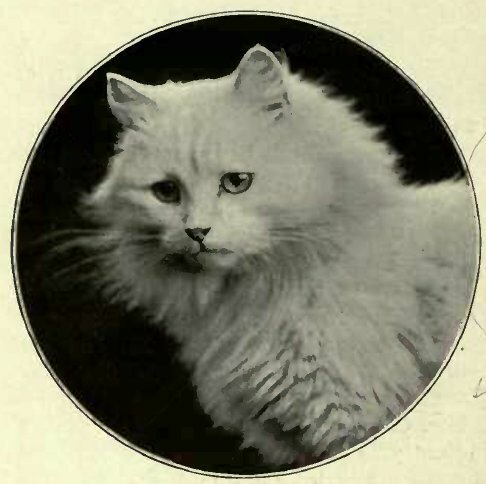 There is always a keen demand for white kittens, either as pretty pets or, if with correct-coloured eyes, for breeding purposes, and, doubtless, when more encouragement is given to this beautiful variety, there will be an increase of fanciers of the white cat, whose praises have been sung in fairy tales, nursery rhymes, and by novelists who have a weakness for describing interiors with a beautiful white Persian cat reclining on the hearthrug. MRS. PETTY WITH HER WHITE PERSIANS. „The blue-eyed white Persian is, I consider, one of the most interesting to breed, and, in my experience, no more delicate or difficult to rear than any other Persian. „I have had them now for nearly four years, and, I think I may say, with a good deal of success. I bought ‚Crystal‘ in 1898, when four months old, and she certainly has been a good investment. Out of the sixteen white kittens she has had, ten of them have been blue-eyed. „The very best kitten I owned was never exhibited; he went to Mrs. Champion, who considered him the best and healthiest kitten for his age she had ever seen. Unfortunately, he died suddenly shortly after she had him. He was by Champion ‚White Friar‘ ex ‚Crystal,‘ and was one of the same litter as ‚Jovial Monk,‘ which did so much winning for Miss Ward, who purchased him from me at the Crystal Palace, where he took first. 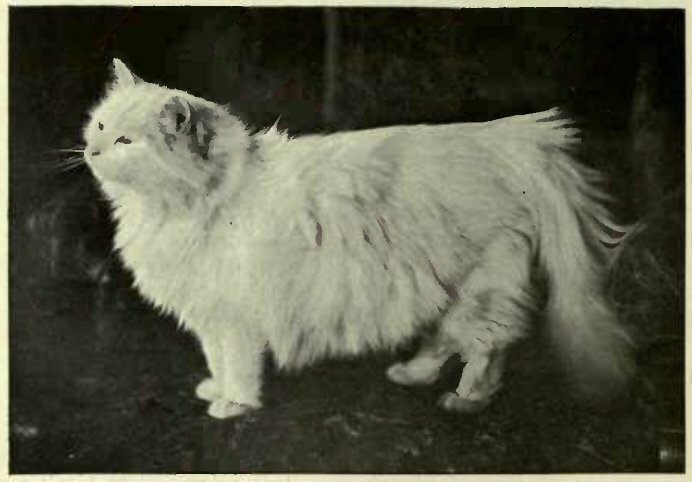 ‚Crystal‘ herself has only been beaten by a white cat, and that had not even blue eyes; but she was in splendid coat, and ‚Crystal‘ was quite out of coat. Most judges are agreed, I think, that ‚Crystal‘ is the best blue-eyed white female in the country. „The colour of the eyes of white kits can be told much earlier than in any other colour; some I can tell as soon as they are open, others I am not quite sure of until they are about a fortnight old. The eyes are generally bright blue from the beginning, without a shade of kitten grey in them. I do not think that both parents having blue eyes makes much difference to the number of blue-eyed kits in the litter. If one parent is blue-eyed and the other odd-eyed the result is often just as good. I know of a green-eyed queen which had a litter of three by Champion ‚White Friar‘ – all were blue-eyed. „As to deafness, I cannot account for it at all, as it often appears, though both parents have perfect hearing. Mrs. Champion, whose name is well known in „catty“ circles, and who has now left these shores for America, did a great deal to establish a thoroughly good strain of white blue-eyed Persians. Her celebrated „White Friar“ (now in the possession of Mrs. Finnie Young and Miss Hunt) is justly considered the finest male specimen in the fancy. Certainly he could only have been beaten by his son „White Tsar,“ bred by Mrs. Champion from her „White Witch.“ This cat, which assuredly would have had a notable career, was sold by Mrs. Champion for £20 to Mrs. Colbourn, in America. He arrived in poor condition and died shortly afterwards. I remember seeing an absolutely perfect white Persian kitten at Mrs. Champion’s. It was by „White Friar“ ex „Crystal.“ He had startling deep blue eyes, tiny ears, and broad, round head, and at nine weeks old his coat measured nearly three inches across. Alas! though healthy and strong, this proved too perfect a specimen for this world, and „Crystal Friar“ succumbed to the epidemic of gastritis then raging amongst our feline pets. 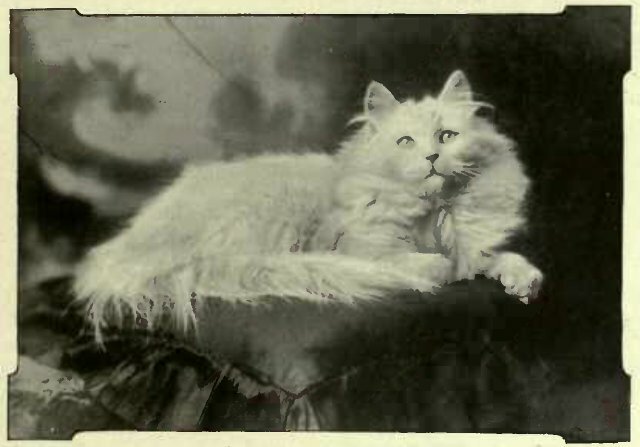 Referring back to celebrated white Persian cats of the past, I well recollect the marvellous size and splendid coat of Mrs. Lee’s „Masher,“ who took the cat world by storm when exhibited at the Crystal Palace in 1890. This enthusiastic fancier paid £21 for „Masher,“ whose show career was shortened by an accident. This cat was remarkable in those days, if only for his grand blue eyes. The well-known breeder andjudge Mr. A. 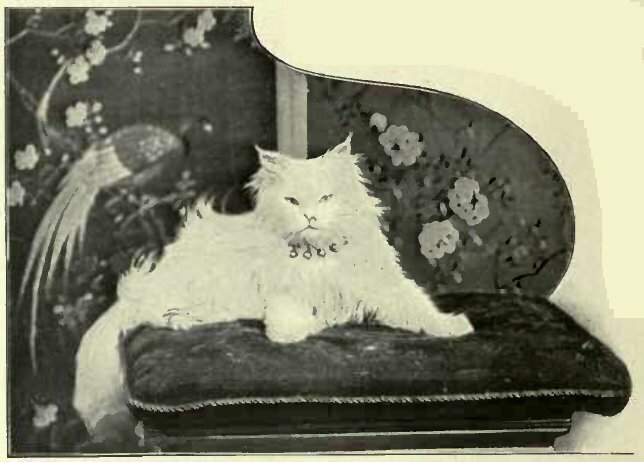 A. Clarke, whose name is more closely connected with blue Persians, once owned a famous female called „Miss Whitey.“ I remember that this really remarkable cat was exhibited in 1887 at the Crystal Palace, and again the following year, when at four years old she took first prize and silver medal in a strong class of nine females. It seems to me that these cats, as I recollect them, appeared half as large again as the present-day champion winning whites; but whether this was in consequence of more profuse coat or a generally bigger build of animal I cannot at this distance of time pretend to determine. „My acquaintance with white Persian cats began some years ago, when I imported a white female as a pet. I was so delighted with her that, although for a London resident white cats would seem the least desirable, I decided to import two blue-eyed whites for breeding purposes. It was a litter from these two cats that tempted me to take up exhibiting. This litter consisted of ALL blue-eyed kittens, the tone of the blue being exceptionally deep. Since then I have, of course, often had a different tale to tell, and odd-eyed kittens have sometimes predominated. This curious freak of nature connected with white cats seems unaccountable. The two colours are generally yellow and blue, but I have seen green and blue. I have also remarked on the very brilliant tone of the one blue eye. „There is a popular belief that almost all blue-eyed cats are deaf. All I can say is that I have never had a blue-eyed white that was deaf. I have, however, often come across those that were stone deaf, and others with defective hearing. Again an unaccountable freak. „White Persian cats have been declared to be the most difficult to breed and delicate to rear. My opinion is that the delicacy is much more in their coats than their constitutions; that is, of course, in comparison with other foreign varieties, none of which are as hardy as the British. „A few remarks as to the cleansing of white cats may be useful. As a dweller in London, I need scarcely say that unless I occasionally gave personal attention to my pussies they would not always be in the show condition that I would desire. Some fanciers wash their white Persians, but I have come to the conclusion that this treatment tends to coarsen the soft silkiness of the fur; and therefore, for this reason, and also because there is a risk of cats catching cold, especially in winter, I advocate dry cleaning, and suggest the use of Pears‘ white precipitated fuller’s earth. One plan is to place the cat on a large sheet or towel, mix a little ammonia in warm water, dip your hands in this, and pass them over and over the fur, letting it become thoroughly moistened but not wet. Then well sprinkle the coat with the powder, and by keeping the animal in front of the fire the fur will soon become quite dry. Then rub with a soft towel, and finally brush thoroughly with a clean and not too hard brush. Your efforts will be rewarded with success, and though puss may be considerably bored during the process, she will not resent it so much as a tubbing. I find that with white females are far more diligent as regards their toilet than the males, who seem always to have more of the Eastern languor and indolence in their nature. I have remarked – and no doubt it is more noticable in the white breed – that as soon as young kittens are beyond their mother’s control they exhibit a marked antipathy to keeping their coats in anything like a decent condition. Sometimes they will make a feeble attempt at washing themselves; but something will excite their attention, and off they will go, or perhaps in sheer fatigue will fall asleep during the toilet. Thus white kittens will very soon present a most unkempt appearance, and the poor mother gazes sadly at them as though the cares of the family were too much for her, and she no longer wishes to own what was once her pride and joy – a spotless litter!